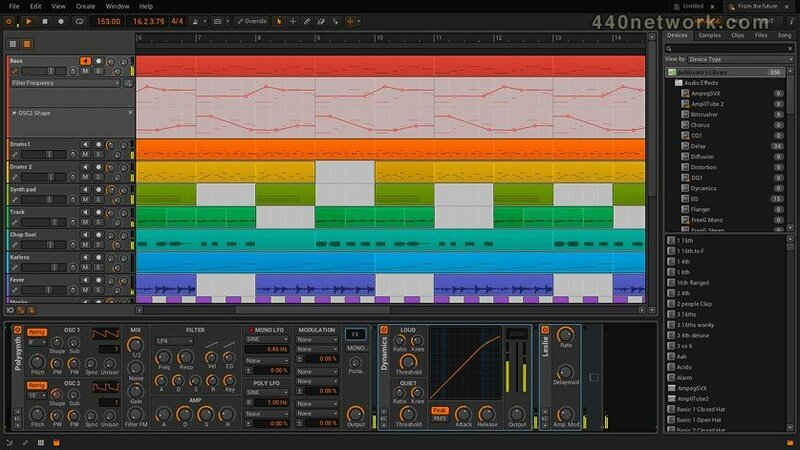 Bitwig Studio est un système de création musicale pour la production, la performance live et le DJing, axé sur des outils d'édition flexibles et un maniement rapide. FIXED Rare audio engine crash during audio playback. FIXED Automation override was enabled when turning automated knobs also when stopped. FIXED ASIO: The Int16LSB and Int24LSB formats resulted in noise for inputs. NEW Add quantize to Math modulator. NEW Java API for development of custom control surface drivers. NEW MIDI slave support for transport sync. NEW APC40 MKII script (rewritten in Java). NEW New controller scripts for Nektar Technology products: LX25+, LX49+ and LX61+ . FIXED MIDI Song Select sends improperly formatted messages. FIXED Crash sometimes when closing the popup browser with a control surface connected. FIXED In drum edit mode, the pen tool deletes the wrong notes. FIXED Keylab 49 controller crashes when switching parameter pages. FIXED Crash when dropping device in device chain. FIXED Differences in Transient Detection between 44,1 and 96khz files. FIXED Bad performance when scrolling through file browser for files that are on a network. FIXED Unsupported format for WASAPI on Windows 7/8.1 if no sample-rate was selected. FIXED Behavior / Bounce bit depth setting has no effect. FIXED "Open containing folder" shown as "action.open_containing_folder.name". FIXED MIDI Program Change might loose the note if it happens at the same time as the program change. FIXED Halion 6 VST2 version does not work in Bitwig Studio 2 on windows. FIXED Drag and drop does not work with Spectrasonics Stylus RMX on windows. FIXED Akai MPK49 script crashes when pressing Shift and Play. FIXED Many notes playing polysynth voices with long release time crash audio engine. FIXED ASIO: Turning off the HW FX power button causes odd feedback behavior/noise. FIXED Bouncing files causes a "Missing Files" notification. FIXED Halion VST3 plugin does not remember its window size on macOS. FIXED Crash when using scroll wheel in Zynaptic plugins on macOS. FIXED Content of 32-bit VST plugin window may loose relation to parent window when switching to another application on macOS. FIXED Incorrect vst2 channel interpretation for plugins which do not implement effGetOutputProperties. FIXED Range of indexed controls was too big. FIXED Fix some devices crash on old Windows systems. FIXED Control Surface API: ClipLauncherSlot.isStopQueued().get() reports true event if this slot is not playing. FIXED Play stop marker on raw audio events not draggable when being zoomed in. FIXED Not possible to create a smart collection in the multi samples tab. FIXED Memory leaks when painting automation points. FIXED Crash when nudging selected automation events after changing selection. FIXED Crash when deleting beat marker by double-clicking on it in some cases. FIXED Hiding and showing the layered editor sometimes results in the window being resized to an enormous size and showing distorted graphics. FIXED Drag-copying notes using time selection tool in clip launcher note editor does not repaint the drop area correctly. FIXED Crash when opening old projects in some cases. FIXED Sometimes automation points jump to different value when adjusting value via arrow keys. FIXED Different MTC framrates don't have any effect. FIXED In drum editor, dragging in the background always erases notes independent of the selected tool. FIXED On some windows machines the icons never show up due to trying to load Java assistive technologies. FIXED Note end might incorrectly show the masked-by-clip indicator when entering notes on triplet grid. FIXED Transport.isAutomationOverrideActive() does not notify callbacks when it changes. FIXED Controller API: Cursor.selectFirst/Last not working in some situations. FIXED Crash when copying integer value automation to clipboard and clicking in another integer value automation lane. FIXED Midi messages could be received before a controller has loaded its preferences. FIXED MIDI Program Change: fix PDC in the chain. FIXED Potential engine crash on macOS when changing sample rate or buffer size on slow hardware devices. FIXED Crash when adjusting value of two equal-timed automation events via inspector. FIXED Dragging the DSP performance graph window to another display makes it disappear. FIXED Potential crash when copying data to the clipboard on macOS. FIXED Crash when pinning device cursor for a control surface in the IO panel. FIXED iZotope Iris VST2 plugin window content looks shifted after resizing and then re-opening window. FIXED Launcher audio clip plays silence if previously played clip ended with a fade out on a contained event while then next clip starts inside the events and both events have identical settings and refer to the same sample. FIXED Possible to get the automation editor to lose the panel with the free-run settings & co. FIXED Adding devices with plugin latency to the FB FX of delay 4 breaks PDC graph. FIXED Controller API: not possible to receive notes on multiple inputs with different masks. FIXED Eraser skips over notes when moving fast. FIXED Cakewalk Z3Ta2 instant crash with VST3. FIXED MIDI Clock slave was too slow to catch up. FIXED Potential crash when opening old projects. FIXED When using clock slave and the tempo goes jitters around 100 BPM the size of the toolbar also jitters. FIXED Raw audio events might not get played for the expected duration when loading old projects. FIXED MIDI Clock Offset now use the same direction as Audio Recording Offset: positive values means earlier. FIXED MTC framerate is not initialized properly on document load. FIXED Midi CC device sends unwanted messages when scrolling through the CCs. FIXED Transposing multiple selected notes using keyboard shortcuts cuts existing notes when "passing through". FIXED ASIO: audio device is not properly restarted when the buffer size is changed via the ASIO configuration panel. FIXED VST3 plugin states were saved with fxb extension instead of vstpreset. FIXED Note Latch: toggle and velocity mode do not work properly. FIXED Crash when erasing notes in drum editor. FIXED Changing play offset for unlooped clips in inspector creates additional overlapping clips. FIXED Step modulated DC offset does go to sleep when not being in focus. FIXED Crash when trying to adjust fades on mixed selection of clips and meta clips. FIXED Editing MIDI CC device knobs, requires to remove the CC prefix. FIXED Polysynth: there is no beating with unison = 2, and in this case unison act as a DC Offset. FIXED Selecting effect tracks from right to left using shift modifier and dragging to main track area can crash Bitwig Studio. FIXED Deleting time range in raw audio event does not work correctly. FIXED Under certain circumstances an extra note will be played outside clip boundaries. FIXED Controller API: Parameter.name() not updated for parameters that are not remote controls. FIXED ASIO didn't work with Realtek driver when using automatic sample-rate. FIXED When drawing automation with pencil tool while being zoomed-in very far into the timeline, the resulting events get thinned too much on mouse up. FIXED Too much smoothing on note expressions. FIXED Scrollbar in midi learn section block the delete button for mappings. FIXED Value of automation point still shown when switching to another application. FIXED VST3 window resizable flag is interpreted incorrectly on macOS. FIXED Show presets for legacy devices by default. FIXED Spectrum Analyzer takes a lot of time to initialize on Windows. FIXED Popup notification for a remote control shows the name of the target not the renamed remote control when adjusting from a controller. FIXED Engine crash when scanning audio devices that don?t report manufacturer metadata on macOS. FIXED Regression on macOS in alpha-2: some VST-2 plugins with resizable window have incorrect size after opening the second time. FIXED Regression: VST3 state wasn't stored correctly. FIXED MTC sends invalid messages. IMPROVED Add a velocity knob to the note sidechain. IMPROVED Added Select All action to edit menu. IMPROVED Better erase tool in note editor. IMPROVED When trying to adjust the value of automation events further than the limits of the value range via arrow keys, it takes the same amount of steps to move it back. IMPROVED Chain device can now output notes. IMPROVED Improved workflow for tracks which are routed to a note/MIDI destination (mute/solo/meters). IMPROVED Note Latch Device not working properly in several modes after preset reload or engine restart. IMPROVED Primary device for a controller will automatically select first instrument if there is one otherwise the first device. IMPROVED PDC: Monitoring latency less influenced by other tracks. IMPROVED Allow to paste events from the clipboard over selected events. IMPROVED Show a notification if we get an unbalanced PDC graph with a submit action that sends the PDC file in the bug report. IMPROVED Configure the MIDI Clock offset in milliseconds. IMPROVED MIDI Clock Slave: stabilize the tempo variations. IMPROVED Show playback follow button in each timeline editor panel (bottom right). FIXED Browser collections would disappear if the contained the '/' character. Now don't allow characters that are not valid in file names to be used when creating a new collection and show an error message if the user does this. NEW Support for Hercules P32 DJ controller provided by Jürgen Mossgraber. FIXED Crash when replacing a launcher clip with key assignment and then triggering the key. FIXED Crash when showing popup browser for a device where the device sort mode was saved in the project as vendor but on loading the new sort mode is by location. FIXED Sends of group tracks are not audible when soloing the return track. FIXED Saving a preset that embeds two different files with the same name is not possible. FIXED Auto/Pre/Post setting for sends of Drum machine layers resets after saving and loading the set. FIXED Send of subtracks in groups are not muted when soloing other tracks. FIXED Crash when openning a project that had a track group scene and a clip selected on the clip launcher when it was last saved. FIXED Workaround for bug in OSX El Capitan that causes full-screen GUI painting being slow when using certain graphics chips (13" Retina Macbook Pro). FIXED When you have VST window open and load a new VST from pop-up browser, the first plugin's window is on top of the newly inserted plugin. FIXED Duplicating an audio event in arranger note editor results in overlapping events. FIXED Window positions of multi monitor setups are not restored on OSX when quitting and restarting app. FIXED When openning very old projects where the plugin states were stored as separate files in the project folder the plugin states would not be found. FIXED On Windows the engine can crash but leaves child plugin host processes around causing complete lockup of the application. FIXED Open u-he plugin while playing an automation GUI triggers automation override. FIXED Stretch modes do not pass phase cancellation with Raw mode when playing back at original tempo. FIXED Rare crash when dragging tracks and automation in the source tracks is deleted while we are dragging them. FIXED Bouncing a scene or meta clip creates a track inside the group track instead of alongside it. FIXED Roll over play button and overview are not shown on bwscene files. FIXED Double kick bug in Clip Launcher. FIXED When moving a window between screens with different scaling factors the window could get into a flickering state where the window couldn't decide which screen it belonged to. FIXED Pop-up windows and context-menus had the wrong scaling-factor in certain multi-monitor setups. FIXED Certain files are not accepted due to a problem parsing tags. FIXED Crash on OSX when trying to paint popup window. FIXED Audio input channels are mapped to wrong hardware channels on OSX when using audio device that has inputs for audio output and a separate device for audio input. FIXED Sometimes, the DSP Performance Graph cannot be moved until it is resized first. FIXED Text input on Linux only uses default keyboard layout - changing layout does not work. FIXED Caps lock is sometimes inverted when entering text on Linux systems. FIXED Controller Surface API: ChannelBank.scrollSends* methods may do nothing. FIXED Control surface API looks weird on Linux. FIXED Added workaround for Roland plugins which didn't work properly in sandboxed hosts. FIXED Sluggish GUI response in some situations on OSX El Capitan. IMPROVED Improved compatibility with Seaboard RISE and EQUATOR. IMPROVED Move the tags column in the popup browser so it is next to the category column to which it closely relates. IMPROVED When searching in popup browser show hit count for all tabs. IMPROVED Controller Surface API: add ChannelBank.scrollToSend(position). IMPROVED Performance: Showing the popup browser with a very large sample library (close to 1 million sample files) would take a while to list the devices even though the samples tab wasn't shown. FIXED Dragging clip end in track note editor enables looping instead of just extending the clip end. FIXED Icon that indicates launch quantization on clip loop bar is invisible when loop region is not selected in an unlooped clip. FIXED If you have only one empty project (tab) open, save the project and immediately create a new project, the previous one will close. FIXED Dragging a track from the browser that contained a VST into empty project after fresh startup would not load the plugin due to missing plugin state. FIXED Controller API: device.addPresetCategoriesObserver/addPresetCreatorsObserver are not updated correctly. FIXED Engine crash when switching documents. FIXED VST window size is wrong in Melodyne 4 beta version on OSX. FIXED Dragging notes from multiple clips in arranger with copy modifier will copy some notes and move others when dropping onto an existing clip. FIXED Volume, pan and CC automation should follow clips when dragging to other tracks if follow clips is active (currently only does so if device chain is identical). FIXED 32bit plugins with carbon windows don't open their window on OSX 10.11. FIXED Removing stop button from clip slot should also remove record button. FIXED Named device cursors should be updated to an existing device if possible when deleting a device. FIXED Regression in 1.3.4: mouse cursor sometimes disappears on OSX. FIXED Arpeggiator plays a full note when the gate is at 0%. FIXED Crash when changing velocities using pencil tool in audio event area of hybrid track. FIXED When saving a project and changing the list of tracks/track groups in that project the browser would not update with the new list of tracks. FIXED Mouse cursors don't look sharp on OSX computers with Retina screen. FIXED If Preroll is active, clip launcher clips already record during the preroll time. FIXED Loop marker for clips on the arranger are not shown in the correct place and moves when zooming in and out. FIXED Searching for letters and numbers (e.g. "7A") in files would not find files that have that in their name. FIXED Dragging a track out of a deactivated group hangs the engine. FIXED Track header width might be different from state before saving after opening project. FIXED Next actions on clip launcher don't work in some cases. FIXED Transpose expression zoom-scrollbar does not line up with timeline content by default in audio editor. FIXED Folded lanes in note editor do not line up with the headers in tablet display profile. FIXED Synced LFOs are not perfectly synced. FIXED Bug in OSX 10.11 LauchServices causes Bitwig Studio to start only once (added workaround). IMPROVED Fold state for drum machine clips shows note name in front of the pad name. IMPROVED Raised silence threshold used by auto-suspend of plug-ins, as it was below the background noise of several popular plug-in effects. IMPROVED Add action to toggle the showing and hiding of all automation lanes on the arranger and shift clicking automation icon in track header changes for all tracks in its group track. NEW New LFO shape: random smooth. NEW Allow MPE mode to be forced on for legacy VST plug-ins which doesn't support the MPE canDo check. IMPROVED Ability to drag multiple files onto a Collection. IMPROVED Flanger's 'Mix' is not a percentage. IMPROVED Improved VST auto-suspend and added visualization in the mixer when devices are processing / sleeping, which c an also be clicked to toggle the enabled state of devices. IMPROVED Onscreen keyboard now shows note velocity, timbre, pitch and pressure adjustment for all notes that are being played. IMPROVED Make the onscreen keyboard and computer keyboard much more responsive for note input. IMPROVED Improved application performance when using many drum chains. FIXED Crash if using the bounce modifier and deleting the destination before the bounce completes. FIXED Crash when turning on loop mode with touch interaction. FIXED Resizing end of audio events that are partly masked by the clip leads to wrong event length. FIXED Waveform overview is missing after bounce and bounce in place when sample rate is set to automatic. FIXED Regression in 1.3.1: window positioning and scaling can get wrong on OSX when hot-plugging screens while Bitwig Studio is running. FIXED Audio editor in track mode shows wrong track after bouncing an arranger time region. FIXED Erase tool does not always work for erasing audio events in the arranger note editor. FIXED Changing tempo for multiple clips in inspector only gets applied to the cursor clip. FIXED Plugins or controllers could break undo history if they started changing parameters but not invoking the corresponing end-change. FIXED Group tracks cannot be moved using touch. FIXED Automatic sample rate does not work for ALSA backend. FIXED Crash when dragging a layer device (or a layer of a device) from one project to another's track header without pressing the copy modifier when the destination project has more effect tracks than the source project. FIXED Numbers in file names are not matched when searching in browser if they appeared directly after a letter without a space (or other punctuation character). FIXED Bouncing was using the wrong sample rate for some WASAPI configurations. FIXED Unknown category in device browser shows empty list. FIXED Controller API: using more than one named cursor device does not work correctly. FIXED Not possible to drag and drop a pattern from Machine (standalone) to Bitwig Studio on OSX. FIXED Crash when selecting a project with the mouse and at the same time pressing the close button for the project with touch. FIXED ALSA backend does not silence channels that we are not outputting to resulting in distortion. FIXED Controller API: crash when trying to select FX slot while device is not present. FIXED Note sources are shown as "not configured" when removing and adding a control script which it belonged to. FIXED Crash when dragging clip on arranger that is being deleted by another clip that is being recorded over it. FIXED Some notes get unselected after quantize and undo. FIXED Inspector switches between drum chain and device info when clicking on different Drum Machine pads. FIXED Quantizing notes with shuffle may result in deleted notes. FIXED Window layout glitches on OSX when skipping over tracks quickly. FIXED Search indexes would become corrupt when deleting files from the index due to a notification from the file system of file being removed. FIXED Controller API: crash when deleting tracks quickly while having certain controllers connected. FIXED Tablet mode: there is no easy way to add samples that are not in the Library (e.g. from project folder) to instruments. NEW Multi-touch support for Windows and Linux. FIXED Projects created in 1.1 that have automation for the cross fader mode cannot be opened in 1.2.0. FIXED No audio inputs shown if you select "none" as input device before selecting an aggregated device as output. FIXED When bouncing a clip with a custom source the pre and post fader options showed a blank line. FIXED Invalid multi sample files can crash the application when scanning library locations. FIXED Colours of track headers & group are not saved in .bwscenes. FIXED Crash when opening a project that had a slot selected in the output track of a nested track group and the track group was not expanded. NEW Automatic quantization of recorded notes. NEW Pop-up Browser: Context sensitive browser that enables more convenient and faster browsing of devices, presets, samples, multi-samples and clips, and allows to audition choices before inserting. NEW Customizable keyboard mappings including MIDI controller support. NEW Jack support including Jack Transport on all platforms. NEW Double-size clip slots in mixer view. NEW Support for high resolution displays on OS X (Retina) and Windows (High-DPI). NEW Multi-touch support on Linux. NEW Per-project action mappings for MIDI controllers (both raw MIDI and via controller scripts) and computer keyboard. NEW Inspector for devices - makes it more convenient to keep overview about modulation mappings. NEW Support for new MPE (MIDI Polyphonic Expression) specification. NEW Added side-chain to ring modulator device. FIXED If you load a project that makes use of a sample that is part of a library pack, but the pack is currently not installed on the machine that loads it, you'll get the message: "This file is available in the package manager. Would you like to download and install it?" Bug: If you click "Yes", nothing happens. FIXED Controller API: track position observer should take navigation context into account. FIXED Macro section displays "Default Preset" after loading a saved VST preset. FIXED Dragging arranger time to clip launcher should make slot empty if no content on arranger. FIXED Saving of VST plugin states crashes the plugin host on Windows. FIXED Icons for file types do not show up in file manager after installing Bitwig Studio on Ubuntu . FIXED Application icon no longer shows for Bitwig Studio on Ubuntu. FIXED Some equalizer bands could go below 20Hz. FIXED Add action to show plugin device window. FIXED Sends of single device chains don't get muted if you mute the main channel. FIXED LFO Phase parameter stopped working when Retrig is on. FIXED Application crash when ungrouping a group track containing a track which routes notes to the track group output. FIXED Crash if rescan of plugin in plugin error list window took some time and window was closed before plugin scan completed. FIXED Engine on Mac OSX crashes sometimes if a plugin crashes. FIXED Arranger cue markers and loop region should always show the events from the top level group. FIXED Crash when showing context menu for a modulation source that is modulating a parameter that is not available (eg if plugin not loaded). FIXED Routing choosers show the device preset name instead of the name of the device. FIXED Crash when consolidating clips on the arranger while the note editor is looking inside one of the clips being consolidated. FIXED Engine crash related to sends of nested device chains. FIXED Instrument Track input chooser button shows empty string when selecting renamed controllers for the first time. FIXED When dragging multiple audio files from the browser and using Ctrl key to put them in one track the files were still put in separate tracks. FIXED Controller API: crash when calling addDeviceCountObserver on device bank of cursor track. FIXED Shortcut modifiers are shown wrong on different operating systems (eg "super" on Mac). FIXED Controller API: accessing sends of drum pads does not work. FIXED Potential crash when no insertion layer is selected in layered note editor. FIXED Rare crash when dragging and dropping clips in the clip launcher. FIXED Controller API: some device parameters are not included in the direct-parameter-id list, but their values are reported. FIXED Big clip height does not resize the group's scene header in the mixer. FIXED When removing a library location it does not get removed from the search results if the cursor is currently inside that location. FIXED Controller API: add selectInEditor to device interface. FIXED Controller API: select functions in CursorDevice not working for nested VST plugins. FIXED Audio engine can't connect to new projects sometimes when dragging tracks from one project to the project tab bar. FIXED Not possible to select a waveform background in layered note editor. FIXED Crash when in mixer view and cursor is in mini device chain and arrow right from last track when the effect tracks are not visible. FIXED Dragging a no looping clip from the arranger to the clip launcher does not set the correct loop region. FIXED Showing the input/output section in the arranger resulted in the track names getting shorter. FIXED Search field is not focussed when opening Popup Browser via Drum Machine. FIXED Occasional crash when dragging empty scenes in clip launcher. FIXED Filtering of control surface shortcut in preferences did not work. FIXED Project folder not named correctly when saving project with a dot in filename. FIXED ASIO: Not all different bit-depths were properly supported + crash with buffer-size of 2048 samples. FIXED When saving clips or presets and clicking ok the last tag in the tag field would not be committed if the user had not typed space after it. FIXED Saved scenes would output to "No output" and could not be previewed in the browser. FIXED Impossible to create Smart Collections within a folder on Windows machines. FIXED Sometimes when making a shortcut assignment that is already made to another shortcut the message is not shown explaining this. FIXED Crash when dragging 2 empty scenes in clip launcher after the last scene in the clip launcher. FIXED Crash sometimes when moving cursor for the any file result of a filter column in the browser. FIXED Crash sometimes when double clicking recently used document in file browser. FIXED Wrong solo behavior for sends when tracks are routed to another track instead of master. FIXED Crash when working with mappings in old documents that contains plugins that can't be found. FIXED Occasional crash when closing document while having controller connected. FIXED Zooming in clip content note editor does not take loop region of empty clips into account. FIXED Controller script does not reach the maximum value if they overflow the range 0..127. FIXED When dragging in a MIDI file with tempo automation ask the user if they want to import the tempo from the clip or not. FIXED Controller API: crash when grouping, ungrouping or deleting group tracks in some cases. FIXED Controller API: "any" filter item should be part of the list of items. FIXED Controller API: crash when calling session.addIsActiveObserver. FIXED Duplicate does not work for Effect tracks. FIXED Links to web site from help menu did not work on Linux. FIXED Tag input field doesn't create tags from pending text input when losing focus. FIXED Notes which are cut off by the same key had a note length jitter when using large buffer sizes in the bitwig instruments. FIXED Controller API: crash when using selectNext/Previous with named device cursor. FIXED Time selection in the arranger timeline header area does not work. FIXED Remember state of popup browser when browsing for samples or multi samples for a sampler. FIXED Clip launcher clips we're slowly drifting apart due to accumulating rounding error. FIXED "Copy value to all layers" and "Copy modulation to all layers" don't work correctly in some situations. FIXED Adjusting time/secs of a beat marker by dragging inspector value is not applied. FIXED Crash when openning a document from native file manager before the main window of the application was shown. FIXED "Plugin windows follow current track" always opens VST GUI on primary screen, regardless on which screen it was open. FIXED Stopping the playback in the middle of a sustain-pedaled note playing creates hanging note. FIXED Unable to drag individual tracks for a document from the file browser. FIXED Window disappears from screen on Windows sometimes. FIXED Glitches when pitch sliding with organ with non-multiple-of-4 buffersizes. FIXED Retriggering the same key from midi is unreliable in 1.2. FIXED It was possible to create a feedback loop by moving a VST Instrument from a group track onto one of its child tracks, if the child track's output was routed to the VST as MIDI. FIXED Engine crashes when connecting to document when a scene file is selected in the browser. FIXED Renaming a track in the inspector creates an undo step for every single character entered. FIXED Renaming a device does not create an undo step. FIXED Crash when shift-selecting multiple launcher clips in note editor layer list. FIXED The same shortcut can be added multiple times to a single action and application would crash when deleting the shortcut mappings. FIXED Crash when dragging an empty MIDI clip into the application. FIXED Application crashes when trying to save clip to browser in some projects. FIXED Pasted notes are not inserted into the correct layer in layered note editor. FIXED Deleting or installing a VST while app is running does not cause the preset browser to update with the change. FIXED Can't activate the audio engine on OSX if set sample rate is set to automatic. FIXED Controller API: old preset related functions are not working anymore. FIXED ASIO: Issue switching sample-rate. FIXED Soloing group with subgroups doesn't play/solo the subgroups. FIXED Controller API: opening application panels such as browser should not try to focus them first. FIXED Shift and right click to open popup browser on favorites should work in empty space too not just directly over the + button. FIXED Controller API: cannot select first device in chain via cursorDevice.selectPrevious(). FIXED Files embedded in clips were not extracted into the project folder when dragged into project. FIXED Crash when switching documents with some controllers connected. FIXED Crash when control script connects to a plugin device under some circumstances. FIXED Soloing tracks routed to hardware outputs does not mute other tracks routed to the same output. FIXED Time and value fields are missing in note expression event inspector. FIXED Inspector shows old button style for mute and solo buttons when clicking on a layer device chain. FIXED Rare crash when selecting device via controller API. FIXED Controller API: crash when switching VST presets on controller. FIXED Macro doesn't receive name when mapped to 'enable bipolar' button of an LFO. FIXED Bouncing a clip on a track in a group to a new track should create the new track within the group. FIXED Context menu for a track in a track group shows a blank line instead of the item to show popup browser. IMPROVED Allow to rename devices. IMPROVED Better support for touch and pen input devices. IMPROVED Modulation mappings from polyphonic sources to monophonic destinations. IMPROVED Attack and sustain modulation sources for Transient Control device. IMPROVED Arpeggiator now analyses incoming note expressions and applies them to generated notes. IMPROVED Stronger highlight for played keys in piano roll editor. IMPROVED Add graph to dynamic devices, such as Audio Mod, Compressor, Dynamics, LFO Mod, Peak Meter, Gate and Transient Control. IMPROVED Display the band's frequency in EQ-2 and EQ-5 devices. IMPROVED Clips on Master and Effect tracks can only be dragged to pre-existing audio or instrument tracks. . IMPROVED Shortcut changes: "B" for popup browser, "Alt-B" for side panel browser. IMPROVED When saving a scene, prefill dialog with scene name. IMPROVED Add VST 64 bit and VST 32 bit file types to the device popup browser. IMPROVED Controller API: add observer that reports if a device is a plugin. IMPROVED Buffer sizes don't need to be limited to power-of-two values on OSX anymore. IMPROVED Add note retrigger option to Step MOD. IMPROVED Add context menu entries for deleting clip automation to editor background, launcher clip overview and automated parameter controls. IMPROVED Focus should not change unless user is making a selection or clicking in empty area of a panel. IMPROVED When saving a project always collect files that are in another project folder to the one we are saving. IMPROVED Controller API: add function to toggle PreRoll. IMPROVED Controller API: allow to navigate items in browser filter columns with nested entries as a flat list. IMPROVED Controller API: add access to siblings of a track. IMPROVED Controller API: track bank should allow to navigate flat track list, so that simple controllers work with tracks groups. IMPROVED Controller API: cursorBrowserItem.selectNext/Previous should perform selection instead of only moving the cursor. IMPROVED Added "Note Steal Release Time" parameter to sampler to let the user control what happens when a note is cut-off by the same key. (useful for cymbals). IMPROVED Added jitter meter to the DSP Performance Graph which will shows how stable the audio processing scheduling is. If its not in the single-digit percentages try another buffer size. IMPROVED The user can tell Bitwig Studio to forget about deleted projects in the recent document list. IMPROVED Remember the next track color. IMPROVED Shift + Click on the meter's peak value resets all the meter's peak values. IMPROVED Controller API: fixed direct parameters should be listed before dynamic direct parameters (e.g. in layer device). IMPROVED Controller API: add option that controls if siblings track bank contains effect tracks and master track. . IMPROVED MMC transport support for generic controller scripts. IMPROVED Controller API: allow to specify whether track cursor looks at flattened tracks, nested tracks, or as shown expanded in the GUI. IMPROVED Optimized the WASAPI implementation for Windows 10. IMPROVED No way of knowing the tuning (in note) of a tune-related parameter other than by changing its value (therefore detuning it). FIXED Crash when adjusting the tempo of a RAW audio event in the inspector. FIXED Saving a clip that contained a VST plugin that had modulation for one of it's parameters would not restore the unmodulated value correctly when dragging clip back into a project. FIXED Engine crashes when overdub recording into multiple launcher clips that are triggered by follow actions. FIXED Slicing reversed audio to Drum Machine does not work. FIXED Selecting a bookmark location and then dragging clip or preset to the results are in file browser would save the clip to the default library location and not the bookmark location. FIXED Default value for pitch bend automation is -100%. FIXED Automation lanes with renameable parameters forget their name after save/load and display empty strings instead. FIXED Inserting expression events at the end of a long raw audio event sometimes snaps to incorrect times. FIXED Rare crash on Mac when file system notifies us of a file being removed in a folder we are monitoring. FIXED Playhead is not moving in absolute arranger clip automation editor. FIXED Deleting master track would not delete the master track but would stop audio output. IMPROVED Update scripts for Livid Instruments controllers. IMPROVED Link to support web site in help menu lands at home page instead of support page. IMPROVED Improve menu navigation using the keyboard. FIXED Controller API: crash when calling CursorDeviceSlotSection.selectSlot while section is disconnecting. FIXED Application quits on OSX without asking to save when activating it and quitting in one go via Cmd+Tab and Cmd+Q, without releasing the Cmd modifier. FIXED Prevent deleting of devices and packaged files in the browser. FIXED Occassional crash when working with time selections in the arranger. FIXED PDC didn't work correctly with delay-inducing plug-ins put inside Mid-Side Split and Multiband FX-2/3 containers. FIXED Export results in cutted audio because of PDC. FIXED Modulation mappings lost to outer device macros when moving a nested device within the nested chain. FIXED Regression in 1.1.7: EQ-2/5 curve does not update when moving nodes. FIXED Track input chooser popup button shows empty string when selecting certain controllers. FIXED Crash when dragging clip while overwriting it in recording. FIXED Controller API: crash when passing null for value parameter into RangedValueAtomIntention.set(). FIXED Error saving multisample when the same sample was used multiple times. FIXED Dragging a clip to a drum pad that is occupied and slicing would add a new chain for that pad instead of using the existing one. FIXED Drag and drop not possible from certain OSX apps and from Finder on OSX 10.7/10.8. FIXED Reversing looped audio clips may result in incorrect play start time. FIXED Reversed raw audio does not play according to the shown waveform in certain cases. FIXED Step MOD was syncing wrong with PDC. FIXED Note Pitch Shifter: negative values are off by 1 note. FIXED Regression: EQ display didn't update properly in 1.1.7 RC3 when the freq/gain/q parameters were automated. FIXED Reversing looped raw audio sometimes results in wrong clip masking offset. IMPROVED Consolidating many clips with raw audio events did not work correctly. FIXED Buttons not responding in activation popup dialogs. FIXED Controller API: position observer of cursor device always reports -1. FIXED On Linux and some keyboard layouts pressing certain modifiers (like Alt-Gr) could stop keyboard shortcuts from working. FIXED Resetting frequency parameter of comb device resets to lower value than actually possible. FIXED Devices with certain modulation routings broke the document graph, causing solo to stop working and output to crackle. FIXED When extending end of raw audio event beyond the maximum length of the event, the successive event might be partially erased. FIXED Crash when moving notes to different lane in folded note editor after moving launcher clip cursor. FIXED When copying clips on arranger with automation follow sometimes there could be duplicate automation points on top of each other. FIXED Solo, routings, sends and browser preview became slow in large projects. FIXED Controller API: observers for parameters of nested devices don't fire after loading document. FIXED Unwanted thinning of events when duplicating or copy-pasting automation regions. FIXED Controller API: has-layers-observer always reports true for plugin devices. FIXED Automation events imported from MIDI files have wrong value range. FIXED Controller API: selection observers in cursor device layer don't fire. FIXED Application could crash if openning a broken document that contained multiple drum chains for a single pad - now it shows error message instead. FIXED Adjusting tempo on reversed audio in inspector makes waveform disappear. FIXED Automation events imported from certain MIDI files contain lots of redundant events. FIXED Controller API: delayed notification of note deletions. FIXED Mouse-wheel was acting funky on EQ displays and drum machine. FIXED Button (on/off) automation write affects the automated value outside of the recorded region when recording the first time. FIXED VST parameters are not restored when assigning a preset to a nested chain. FIXED Automation not updated correctly in arranger when drag-inserting points in clip content editor. FIXED Changing track mute during session recording makes the track output remain silent even when not muted. FIXED EDIT panel layout: automation lane in arranger note editor (clip content mode) shows the content of the clip launcher automation editor instead of arranger automation editor. FIXED MIDI CC data not imported with MIDI clips. FIXED Occassional crash when making time selections in the detail editor. FIXED Potential hang of application when shutting down. FIXED Prelisten in browser randomly plays loops at wrong speed. FIXED Moving raw audio snippets can create gaps after the new event end. FIXED OSX launcher requests to download JRE 1.6. FIXED Not possible to show the clip launcher in the mixer panel in the dual monitor studio display profile. FIXED Mixer panel could allow resizing to a smaller height that it should really allow. FIXED Adding a raw audio clip from browser results in wrong length of the clip. IMPROVED Controller API: it should be possible to call addDatagramPacketObserver from other observers to make IP address user configurable. IMPROVED Controller API: add device bank for siblings of cursor device. IMPROVED Allow the note receiver device to receive the note output of devices and not just tracks. IMPROVED Increase the maximum number of files that can be dragged from the browser from 50 to 128. IMPROVED Controller API: better support for navigating device slots. IMPROVED Controller API: layers in DeviceLayerBank should be sorted by drum pad layout in case of drum machine. IMPROVED Controller script for CME Xkey. FIXED Crash when using context menu on arranger loop region while cue markers are selected. FIXED Controller API: potential crash after controller has been disconnected. FIXED VSTs which sent MIDI events with invalid timestamps (Liquid Rhythm) could crash the engine. FIXED After opening Multisample Editor, opening and closing of collapsible tracks in mixer does not work anymore. FIXED Crash when ctrl-clicking time selection in the track automation detail editor while clip time selection is made in the arranger overview. FIXED Crash in controller API when deleting multiple tracks with backspace key. FIXED Crash when loading 32-bit float wav files on Linux on older CPUs which doesn't support SSSE3. FIXED Rare engine crash when bouncing/exporting audio material. FIXED Crash if dragging files to a track and while those files are being loaded for insertion the track is deleted from the project. FIXED Controller API: crash when navigating cursor to next track while document is closing. FIXED Application crashes if control scripts tries to set an unsupported automation write mode. FIXED Rare crash when working with audio files. 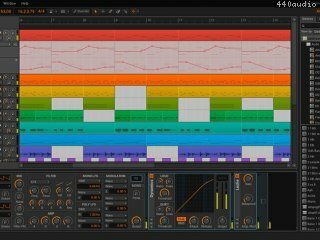 FIXED Hybrid track with sampler and a following Bitwig device does not play bounced-in-place audio when the track is not selected. FIXED Controller API: assignPolyphonicAftertouchToExpression function didn't work. IMPROVED New controller scripts for Nektar Technology products: LX49, 61 and 88, as well as for iX49 and iX61. IMPROVED Attach plugin states to projects when saving so that the plugin-states directory in the project folder is not needed. IMPROVED FX audio and instrument chain device should be one device that intelligently determines the preset type based on the devices inside it. IMPROVED Updated scripts for Arturia Keylab controller family. NEW We now send out SysEx messages to VST instruments for transpose note expressions if the plug-in claims to support canDo("midiSingleNoteTuningChange") and the other note expressions if the plug-in supports canDo("midiKeyBasedInstrumentControl"). IMPROVED Controller API: add observer that reports if the device is nested inside another device. FIXED Pre-roll settings wasn't saved in the preferences. FIXED PDC: Modulation routings from Audio MOD wasn't correctly compensated in certain cases. FIXED First drag of a micro-pitch expression does not snap to semi-tones. FIXED Occassional crash when returning to arrangement or stopping a track via controller API. FIXED Engine crash when dragging audio files on clip launcher preview slots on non-preview tracks. FIXED Controller API: direct parameter observer does not report the latest value, it is always one step behind. FIXED Rare crash when popup windows are closed on OSX. FIXED Moving stretch markers in the detail editor does not snap correctly anymore. FIXED VST plugins that have a file creation date at the beginning of Unix time are not being scanned (e.g. Sonalksis OSX). FIXED Possible to create automation points on the arranger with negative arranger time for the very first point created by clicking in the margin before time 0. FIXED Bipolar macro values are only loaded correctly when loading preset twice. FIXED VSTs should never sleep if their GUI is open. FIXED Engine crash when switching preset for VST running in bit-bridge mode. FIXED Engine crash after changing buffer size after audio recording. FIXED Timing bug in E-CLAPand the noise section of E-SNARE. FIXED Moving a project file into a sub folder of the project folder would cause plugin states to be lost if the application was restarted and the file was opened. FIXED Bounce in place turns instrument track into an audio track instead of a hybrid track. FIXED "Insert Silence" doesn't move Cue Markers. FIXED VST Device knobs don't wake up from sleep when being assigning modulations. FIXED Controller API: device layer selection does not work correctly. FIXED Tempo field in audio event inspector does not get updated when undoing tempo edits. FIXED Controller API: CursorDevice.addCanSelectNext(Previous)Observer is not updated correctly after script reload. FIXED Controller API: canScroll observers are not called for device layer bank and drum pad bank. FIXED Controller API: Scene.exists().addValueObserver() is never called. FIXED Channel Aftertouch and Program Change messages didn't work on MIDI in for Linux. FIXED When dragging an unnamed arranger clip to the browser the default name to save the clip under has "Scene x" appended to the name. FIXED Helper windows such as DSP graph or Scripting Console should not become full-screen with their parent window on OSX. FIXED PDC does not work correctly for chains of Multi-Out VSTs. FIXED Timeline controlled launching in clips does not work correctly. FIXED Dragging note start might result in incorrect order of notes, which causes playback errors. FIXED Engine crashed when playing audio files with audio I/O running at 192 kHz. FIXED Creating beat markers via double-click always prefers onset snapping, even if the preview shows differently and object snapping is disabled. IMPROVED Dragging in a device does not always make it selected after the drop. IMPROVED Controller API: distinguish between mixer and editor selection in channel interface (added selectInMixer, addIsSelectedInMixerObserver). IMPROVED Controller API: add access to deactivated state to channel interface. IMPROVED Controller API: add access to open state of plugin windows. IMPROVED Show progress when auto-detecting controllers. IMPROVED Made auto-detecting of MIDI controllers faster. IMPROVED Add support for AKAI EWI controller. IMPROVED Add keyboard shortcut for zoom to fit (Cmd/Ctrl+0). IMPROVED When a disk-streaming buffer-underrun occurs (for instance when jumping to a location in a sample which could not be predicted), a fade.in is now applied when the streaming catches up to prevent clicks. IMPROVED Updated scripts from Livid Instruments. FIXED Plugin's window header is sometimes out of screen on Windows. FIXED Add SysEx probe command to control surface console. FIXED Parameter names not shown for UAD (and some other) plug-ins. FIXED Freeze when moving MOD device within another MOD device's FX chain. FIXED EQs could blow-up when using extreme Q values with four-pole LP/HP filters. FIXED UAD plug-ins all get the title "UAD powered plugin" when added to the device chain. FIXED Improved Linux MIDI support - Virtual MIDI now works. FIXED Crash when undoing the deletion of an automation lane for an indexed value atom. FIXED Hybrid audio/MIDI interface M-Audio Audiophile 24/96 not recognized as MIDI device in Linux. FIXED Overdubbing notes in the clip launcher does not end the undo operation when the user turns off the overdub button. FIXED Crash when dragging arranger clips with automation follow in some circumstances. FIXED Selecting automation points on the arranger using rectangular selection tool is extremely slow even when zoomed in on small part of the automation. FIXED OSX gatekeeper trouble introduced by OSX 10.9.5 and 10.10 Preview. FIXED Auditioning is too loud when changing velocity of notes. FIXED NI Maschine drag and drop from plugin into the host does not work. FIXED Crash on OSX when switching display profile while an audio interface is configured that is not available anymore. IMPROVED Various improvements in Arturia KeyLab scripts. IMPROVED Minor style tweak in controller API documentation. FIXED Crash when dragging a drum pad to another drum pad. FIXED Regression: automation recording inserts additional points with default value or does not work in some cases. FIXED Moving a nested device chain could cause weird problems/crashes if the chain's mixer had automation for some of it's parameters (eg volume or pan). FIXED Note editor piano keyboard doesn't audition keys until a note is added to the clip. IMPROVED Allow sorting of devices in the device browser based either on vendor or location. IMPROVED On Mac OSX updating a plugin would not cause the cached information for a plugin to be invalidated so the old information would be used. IMPROVED Improved Export Audio dialog. FIXED Certain wav files couldn't be loaded. FIXED Control-mapping indication get stuck on the devices for some scripts. FIXED Not possible to change order of tracks after loading project with hidden effect tracks. FIXED Opening the user guide on non-Ubuntu Linux may cause the application to hang until the user guide is closed. FIXED Occasional errors when saving plugin states that should not be errors. FIXED Various rare and random crashes when displaying the GUI. FIXED Launchpad does not update lights when switching modes on Linux. FIXED Crash when browsing a file that has unicode surrogate pairs in its name. FIXED Very rare crash when browsing some plugins. FIXED Disarming a track while a clip is recording in clip launcher does not stop the clip from recording. FIXED Crash when occassionally dragging clips between tracks on the arranger with the single track insert modifier pressed. FIXED Openning the package manager always causes a rescan of repositories and forgets about the currently installing packs. FIXED Rare crash when working with rectangular selection. FIXED Crash when stretching start of audio event after order of beat markers got incorrect somehow. FIXED Very rare crash when using the knife tool in note or automation editor. FIXED Regression: crash when setting note start to selected warp marker. FIXED Crash when adjusting curvature of expression events. FIXED Crash when using CNTRLR script that was using a hidden controller API method. FIXED Crash sometimes when showing a plugin loading error message. FIXED Crash when showing context menu in file browser for a folder when there are no bookmarks. FIXED Regression: 1.0.9 would complain about insufficient disk space when installing packs on a fresh system. FIXED Glitch VST does not show the plugin window on Linux. FIXED On Windows updates in the browser could be incorrect when modifying files. FIXED Showing expanded device popup menu does not close the compact device menu. FIXED Crash when moving expression segment with cmd/ctrl modifier. FIXED Crash when adding expression event to multi-selection by shift-clicking on it (regression). FIXED Double-click audio event header to split event only works in clips that start at time zero. FIXED Layered note editor in clip mode does not paint notes in locked layers ghosted. FIXED Clicking above or below a note in folded note editor would audition the note if audition is enabled. IMPROVED Improved time-stretching sound quality. IMPROVED Better support for generic MIDI keyboards. FIXED Modulation pie in sampler shows wrong values when played if parameters are mapped to polyphonic modulators. FIXED Key tracking in sampler does not have any effect when assigned. FIXED VST host process on linux used main as entry point instead of VSTPluginMain. FIXED Using the "apply project tempo" button in the beat marker inspector caused undo/redo to stop working. FIXED Tool device causes loud clicks when toggling the phase invert buttons. FIXED Windows documents folder location problem. FIXED Copy modifier used to switch between dragging multiple files as single or multiple tracks was broken. FIXED Add ability to configure "My Library" location and show it by default in the browser. FIXED Repeated text characters are not typed on Linux. FIXED Problem with selecting devices in Korg nanoKontrol script. FIXED Cursor device in Akai MPKmini script does not work as expected. FIXED Note editor layers might still be visible after clips/tracks get removed due to undo operation. FIXED Muted state of notes is not visualized in folded note editor. FIXED Insert silence does not move automation. FIXED Time selection has wrong range when selecting expression events or beat markers in arranger note editor. FIXED Wrong time offset when moving onsets in later clip loop iterations in arranger note editor. FIXED Reversing a clip has no effect on raw audio events. FIXED Copying muted notes creates unmuted copy. FIXED Changing the length of multiple selected notes spread over multiple clips in track note editor behaves erratic. FIXED Visual glitch in preview when drawing expression events over multiple audio events using pencil tool. FIXED Crash when exporting empty arrangement as MIDI file. FIXED There's no way to remove a bookmark from the browser. IMPROVED Importing type-0 MIDI files should split events into different tracks based on MIDI channels. IMPROVED Importing MIDI file should consider track name metadata. IMPROVED Importing MIDI file should consider tempo meta events. IMPROVED Allow to adjust note length and velocity when inserting notes via double click and drag. IMPROVED Allow velocity adjustment when drawing notes using pencil tool by dragging vertically. IMPROVED Audition notes when clicking on them (if enabled). IMPROVED Avoid note start jumping when using note pencil tool. IMPROVED Remember last note length when using pencil tool for notes. IMPROVED Improved efficiency of monitoring library locations when new files are copied or deleted from library locations. IMPROVED Audition notes (if enabled) when adjusting note velocity. FIXED Novation Launchpad does not work on Linux. FIXED Dragging note or audio event start can result in overlapping notes. FIXED Changing velocity in piano roll editor via Ctrl/Cmd+Shift+Drag should also work when the target note is not selected yet. FIXED Stretching audio events might result in overlapping events. FIXED Crash when splitting at onsets, then quantising to wider grid than event lengths, then dragging event start. FIXED Rare crash when double-clicking on clip in clip-launcher to show its contents. FIXED Note velocity cannot be changed by dragging not with modifier if note is not selected. FIXED Crash when moving clip from effect to non-empty master track. [Fixed] plugin windows should appear in the center of the screen when opening the first time on OSX. [Fixed] crash if custom cache location has been configured but does not exist and can't be created at that location. [Fixed] exporting audio as wav in floating point format creates a file with garbage audio.